Okay, look: We both said a lot of things that you're going to regret, but I think we can put our differences behind us; for science... you monster. 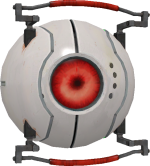 GLaDOS (Genetic Lifeform and Disk Operating System) is the central core designed to control, guide, and oversee the Aperture Science computer-aided Enrichment Center. With the ability to shift and move facilities and various chambers, GLaDOS is able to achieve a seamless and almost infinite testing design whilst residing in the Central AI Chamber. In possession of a feminine programming, she is the antagonist of Portal and the first half of the single-player campaign in Portal 2. During the later half, she becomes the game's tritagonist. 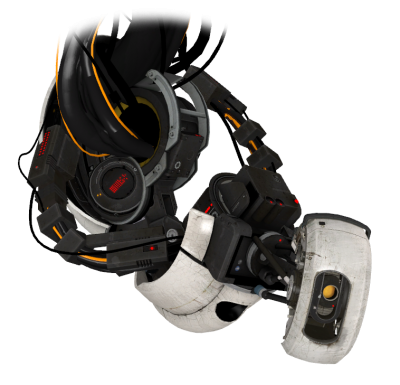 In the game's cooperative campaign, GLaDOS is the testing supervisor of Atlas and P-body. 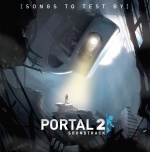 GLaDOS is voiced by opera singer and voice actress Ellen McLain. 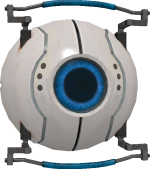 GLaDOS was a creation of Aperture Science, a personality core designed exactly to be fitted as a central computer mainframe. The project began under the oversight of Cave Johnson over the company, and was an attempt to create a fully functional, advanced artificial intelligence which was originally intended to be occupied by Johnson as one of his attempts to cheat death. After it became apparent to Johnson that he may die of moon rock poisoning before development on GLaDOS would be completed, Johnson motioned for the scientists to insert Caroline instead. After a decade's worth of hard work, GLaDOS was officially activated in 1998, as part of one of the many events during the company's "Bring Your Daughter to Work" day. Since she was able to take control of half of the facility's features, GLaDOS began killing most of its inhabitants by flooding the Enrichment Center with neurotoxin. However, only few if not only one of the staff such as Doug Rattmann had survived her attacks along with the series' main protagonist, Chell. The destruction of the company also coincided with an invasion of Earth, which had occurred two days after at Aperture's rival company, Black Mesa. This ultimately led to the negligence of the outside world from realizing Aperture's fate, as all attention had been diverted to Black Mesa and the aforementioned invasion. She then awakens Chell for her mandatory testing of the Handheld Portal Device, which began the events of Portal. During these time periods, she constantly intimidated Chell during her performances and gave bitter yet innocent sarcastic notions by simply acting out like conveniently placed pre-recorded messages. Several tests later, Chell would later discover the various graffiti left behind by Rattmann and immediately became aware that this was not the case, but was forced to play along with GLaDOS' plans. After Chell completed the final test chamber, GLaDOS immediately revealed her true colors as she attempts to lower her into a pit of fire. Chell was able to escape her attempt to incinerate her and from there, Chell makes her way throughout the facility in an attempt to escape, to GLaDOS' horror. As she traverses the facility, she realizes the only way to escape from it is to confront GLaDOS in her chamber, a conflict which Chell won by incinerating all of her personality cores. 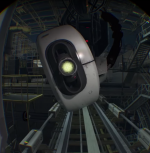 At the conclusion of the conflict, GLaDOS was heavily damaged, and thrown into the parking lot, where she remained dormant for an unspecified amount of time as the facility degraded over the years. GLaDOS then decides to return Chell to the facility's science experiments to further her cause of science, but now having a lot of resentment against Chell for her previous destruction (she claims at one point that she had to relive the last moments of her fight with Chell over and over which, if true, would be a long time indeed), she constantly makes various taunts and snarky remarks at Chell while testing her, and plans to try to kill her again. As Chell and GLaDOS continue to journey through the pasts of Aperture Science located in the salt mine deep beneath the Enrichment Center, GLaDOS slowly becomes familiar to Johnson and Caroline. As they are finally ready to leave the salt mine, GLaDOS spots a poster on the wall, showing what to do in the case of a rogue AI, a paradox. GLaDOS also has an epiphany on who Caroline is but remains silent on the matter. The duo then have made their way back to the modern Enrichment Center, where Chell and GLaDOS use the paradox on Wheatley, but ultimately fail because Wheatley is too unintelligent to understand it. They are put through Wheatley's testing tracks. 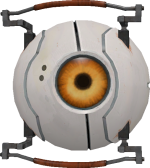 When Wheatley later realizes that GLaDOS had built two robot test subjects prior to Chell and Wheatley's sabotage over the facility early on in the game, he finally attempts to dispose both GLaDOS and Chell. When the duo manages to escape from his grasp, they head to the Central AI Chamber to confront him. GLaDOS proposes that Chell is to attach her back into her body to resume her control over the facility. The conflict was then resolved by their conjoint efforts, resulting in the exile of Wheatley to outer space and a reconciliation between each other. 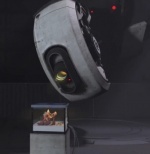 Before Chell could leave the Enrichment Center for good, GLaDOS decides to return Chell's Companion Cube from her tests in Portal by ejecting it from the lift. This topic remains untouched through the entirety of their second testing track, Mass and Velocity. However, at the end of this course, it became clear that she would continually send them outside the testing tracks again to handle her secret full takeover on the facility. As Atlas and P-body work together to get each other past the air circulation maintenance section, they find another disc and install it into the projector. GLaDOS again scans through and proceeds to tells them that she did not really need them to do this, and pretends their mission did not matter after self-destructing them again. GLaDOS begins to show compassion toward the birds as she realizes their ability to use their beaks and considers them as test subjects, also revealing a more motherly bonding with the birds than she ever did with the "mushroom" bots. The fate of these birds remain unknown. As the overseer and operator of the facility, GLaDOS is seemingly omnipotent, able to reconfigure rooms and carry out actions at her will. She monitors the facility and its test chambers through cameras mounted on walls. She also mentions that she cannot resist thinking of paradoxes if one would happen to be brought up. 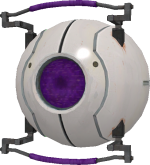 GLaDOS had displayed little to no emotion within her voice tone in the first half of Portal, due to being bound by the consciousness of other personality cores attached onto her for the sole purpose of restricting her true thoughts. She then becomes increasingly more agitated and is portrayed as a narcissist during Chell's escape attempts. 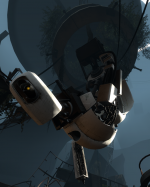 In Portal 2, she grows bitter after the events of Portal, and is no longer bound by the restraints of her cores. She frequently insults Chell until the very end - until she briefly realizes that Chell was "all along [her] best friend". 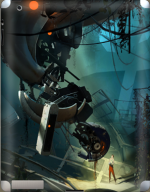 In the game's commentary mode, Jeremy Bennett (art director) describes GLaDOS's design: "[...] we settled on a huge mechanical device with a delicate robotic figure dangling out of it, which successfully conveys both [her] raw power and her femininity." Originally, according to Bennett, she resembled an upside-down version of Botticelli's "Rise of Venus". 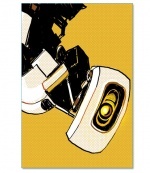 GLaDOS' Valentine card from Valve's official Portal 2 blog. GLaDOS' as seen in LEGO Dimensions. GLaDOS' modified appearance in the Robot Repair experiment. 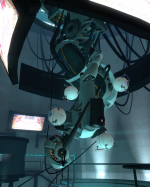 GLaDOS makes a cameo appearance in the Telltale game Poker Night 2, where she plays the role of the dealer and occasionally banters with the other players. She also appears as one of the many minor antagonists in LEGO Dimensions. This page was last modified on 11 April 2019, at 16:27.